Very malty nose throughout the glass. Creamy carbonated head with abundant lacing. Hops in the finish, but not overtly intrusive. As the story on the website goes, a priest, Fr. P. Love, (for real...look it up), anointed the first batch from the brewery in 1871. More proof that God loves us and wants us to have beer! I must say that the more of these European beers I sample, the more I appreciate them. These have so much more flavor, character and buzzzzzzzzzzz than most beers here in the U.S. 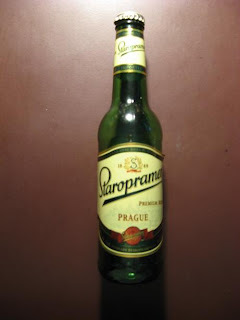 Even their website is full of good things, like the history of beer and a tour of the Staropramen city. Good beer!